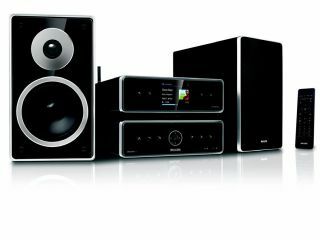 Philips unveiled a new stereo system that places another device in the 'shiny, glossy product range' it seems to be into at the moment. Hot on the heels of the WACS 7500 wireless music system comes the MCi5000 Wireless Micro HiFi, boasting USB inputs, HDD CD ripping capabilities and internet radio goodness for the days when you're wondering what the cool kids are listening to in Uzbekistan. The system looks like a stack, with controls on the top and an amp on the bottom, but the two are held together with a CD slot so you can upload all your favourite choons to the pretty large 160GB hard drive. USB inputs will handle your day-to-day track-lusts when you don't have a CD handy, or could even be used to expand the hard drive if you fill the stereo's capacity. Though how you'd do that when you can fit 2000 CDs on there is anybody's guess. Out from August this year, it'll probably retail for around £500, but rumour is the price might drop around Christmas time, so for the style and functionality it's likely to be a bit of a bargain.